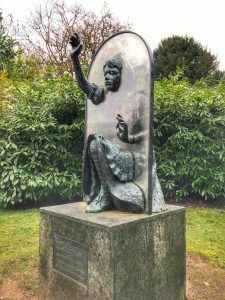 If you make your way from Guildford Railway station this would be your first stop after 9mins of walking and before heading into town: The Statue of Alice with her sister watching the rabbit go down the hole is in Millmead by the River Wey and opposite Debenhams. This statue was created by local artist Edwin Russell in 1984 and is the first inkling of the relationship between Guildford and Lewis Carroll. 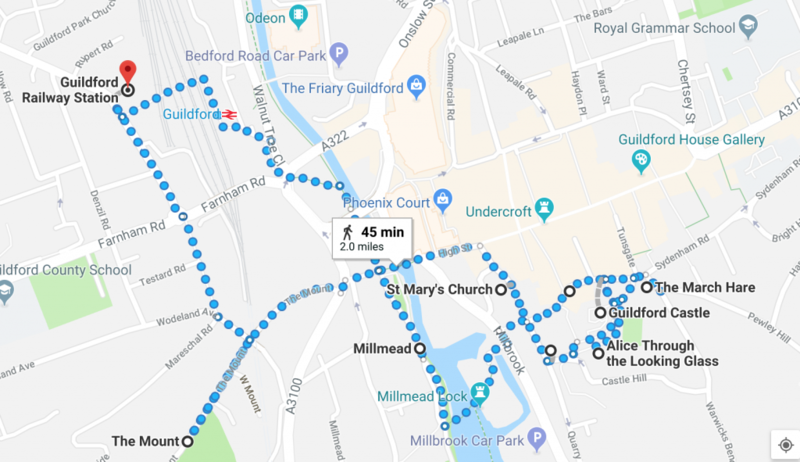 Across the river, a 6 mins walk will take you to the Guildford Museum housed in beautiful, historic buildings next to the Castle Grounds. 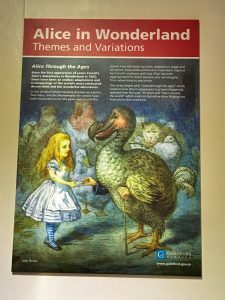 The exhibitions are free to visit and include a variety of changing exhibitions, plus a permanent collection of memorabilia of Lewis Carroll and Alice. Including but not limited to first book covers, ad’s, photographs of casts from the play etc. Also, a great place to pick some themed postcards and stationery up. Everything from here on is a stone throw away from each other. 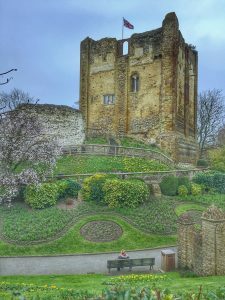 Wander through the Guildford Palace. 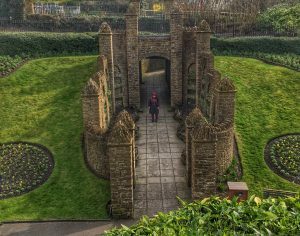 The palace gardens make it is easy to imagine the Red Queen darting to and fro, the Red King snoring under a tree, and Humpty Dumpty trying to keep his balance on the remaining bits of castle walls. 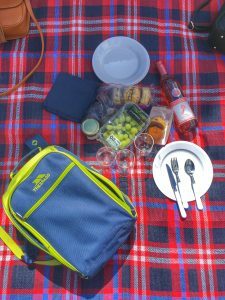 The lawns make a beautiful place to have a picnic or to enjoy a leisurely stroll. Lewis Carroll finished Through the Looking Glass during his 1871 visit to Guildford. One of the most touching memorials is the modern sculpture by Jeanne Argent. Erected in 1990, Alice Through The Looking-Glass is on the eastern side of castle gardens and near the back garden of the Chestnuts. The Chestnuts on Castle Hill remains intact and its memorial plaque sports figures from Alice. 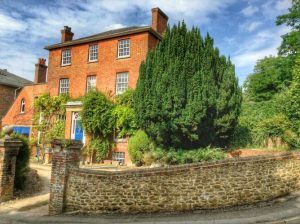 Although Carroll lived in Oxford, he spent Christmases, holidays and many weekends with his sisters in this home, in Guildford. Currently in private ownership, so one cannot go in, but still worth a glimpse from the outside. 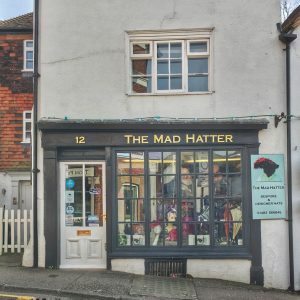 Right next to The March Hare you will find The Mad Hatter, a traditional hat shop that turns heads. They make an amazing range of fascinators and hats from a wide selection of different designers, both British and international. 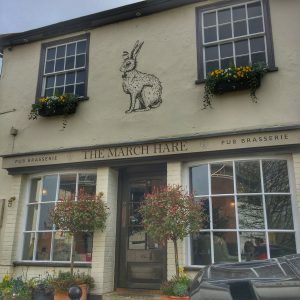 If you fancy meeting the mad hatter you better go in and find one that fits! Much of the Guildford that Carroll knew and loved survives. Make your way to St Mary’s Church in the town centre. The author, whose real name was the Rev Charles Lutwidge Dodgson preached here. St Mary’s is the oldest church in Guildford. The tower dates from around 1050 AD. It was on his Christmas visit to Guildford in 1897 that Carroll caught influenza, and died. 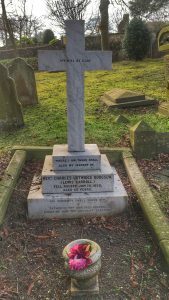 After a funeral service at St Mary’s, he was buried in the new cemetery on The Mount, which can be reached after a 10 min tough uphill climb out of town. It’s off course and better reached by car or bus, to pay homage to this great writer. If you’re arriving by car: Park at the Castle Car Park and it will be easier to do this walk starting from the bottom of this list. This entry was posted in Adventures, Latest Articles and tagged Alice Guildford, Alice Through The Looking-Glass, Ben’s Collectors Records Store, down a rabbit-hole, Guildford, Guildford Museum, Guildford Palace, Lewis Carroll, Lewis Carroll Alice, Lewis Carroll Guildford, Lewis Carroll Home, St Mary’s Church, Surrey Hills Coffee Guildford, The Alice In Wonderland Trail In Guildford, The Chestnuts, The Mad Hatter, The March Hare, The Royal Oak, The Tea Terrace Restaurant & Tea Room, Walks in Guildford, White Rabbit. Bookmark the permalink. This looks like an amazing route to walk and something to keep little minds entertained along the way! That sounds like a fascinating walk. I don’t know much about Lewis Carroll but am looking forward to reading the books with my son. And Guildford Palace looks wonderful! I’ve never been to Guildford but very tempted to go just for this as it looks so much fun for the family and I do love Alice in wonderland. I would love to walk around this palace garden. Looks beautiful. What a fantastic way to encourage a walk through a city. Sometimes it’s hard to keep children interested on a walk but this is brilliant. Oh how lovely! We love this kind of trail, it’s great to get out and explore! The Alice Through the Looking Glass statue is really quite eery. I can’t take my eyes off it. So much to see and do. What a lovely sounding trail! Will have to bookmark this for whenever we’re in the area. This looks like an amazing place! 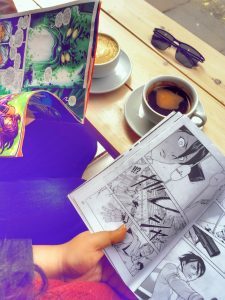 Great place for any Wonderland fans. Oh my daughter in law is Alice obsessed so would love this! My Isla would love this. Always looking for close-ish long weekend ideas. Adding this to the list! What a post! Im passionate with this kind of trips and this will be absolutely my next destination! It is a really very good walk.